This hair comb is gorgeous! This would look stunning perched into a curly up do. A pretty lacy garter to either keep or toss! You get either option and although they’re elastic, you also get to choose your size for a perfect fit. So very glamorous! Pair these earrings with any hair style for a gorgeous pop of color. 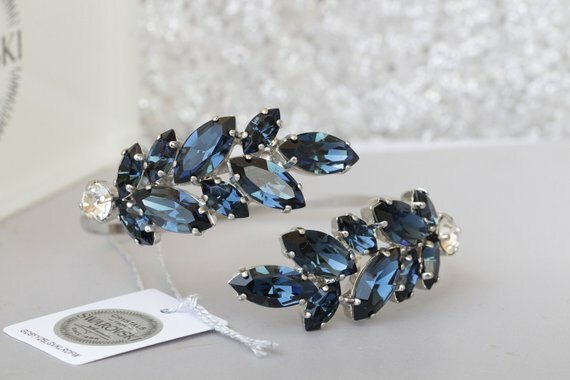 Oh this bracelet is gorgeous (and would match well with the earrings above!) It would be a stunning way to wear your something blue. It’s also adjustable, too, so no worries on whether or not it’ll fit your wrist. It ships from Israel, however, so make sure to give yourself some time for it to arrive! If you’re wearing boots to your ceremony or just want something warm to wrap your feet in on your honeymoon, these adorable customized socks will do the trick! Someone please catch me. I’m dying over these mesh, sparkly beauties! Too dramatic? I don't even care. They're that gorgeous. They’re a bit pricey (over $300), but if shoes are a priority to you, then snag these pretties. They’ll make your whole ensemble beautiful! If you’re a vintage kind of a gal, though, and don’t mind a bit of a heel, these scalloped lovelies would be a gorgeous pop of color. They also come in different colors if you’re not feeling this turquoise blue! A dainty pop of blue around your neck. This necklace would look gorgeous with a strapless dress!